Many of the pages you see here were actually scrapped the last week in June. 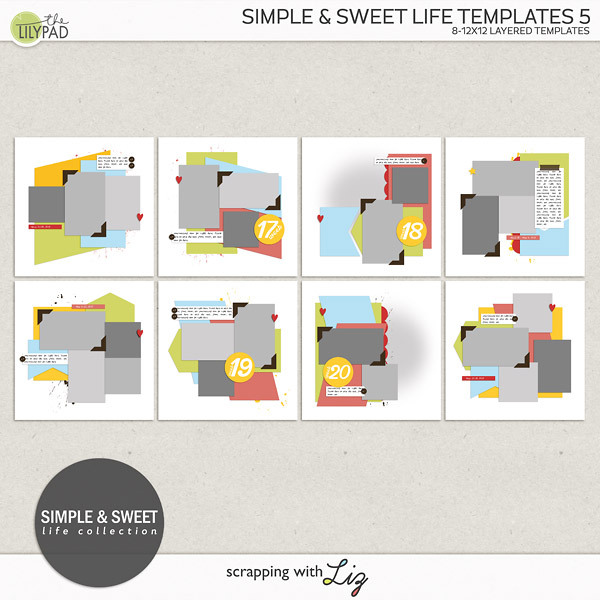 I went through a phase where I wanted to scrap without templates (shhh, don't tell anyone). Actually, I do it every once in a while just to get a fresh perspective....and because I really want to scrap but I feel like I should be working instead (aka making templates). So if I scrap without a template I get the best of both worlds. I get to scrap and then I can turn it into a template. 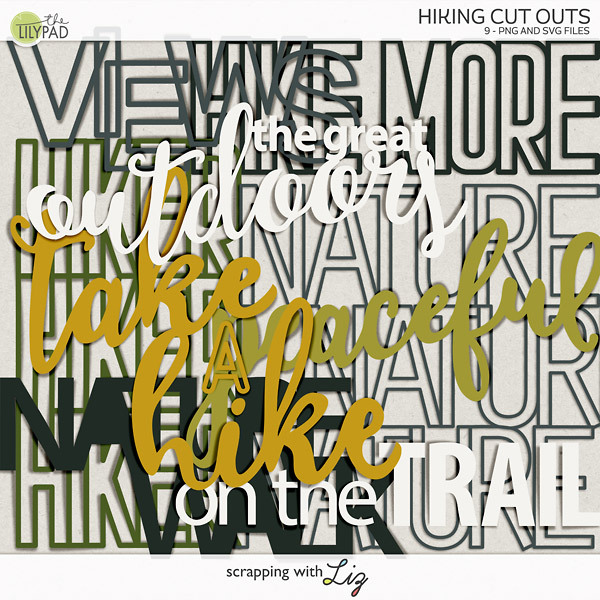 Work=Scrapping, that sure does make me happy. I usually work at least a month ahead of time. While I made these pages last month, I couldn't really share them with you because they hadn't been released yet. I guess I could have shared them but then you might have wanted to know where the template was and I wouldn't have been able to tell you. Bummer. That's why I waited. Enough chatting. I think I've been cooped up with 4 girls way too long and just needed someone to talk to! Let's get to the pages. The first seven you see are some of my final pages of China. I haven't scrapped them in order so some of them are from the beginning of my trip and some from the end. I have officially finished Lydia's album....although I still have a few more pages to show you. Those will have to wait until next month when the templates are released. Yes, I actually have all of my August products ready! Woohoo! Just some scenic pictures to remember. 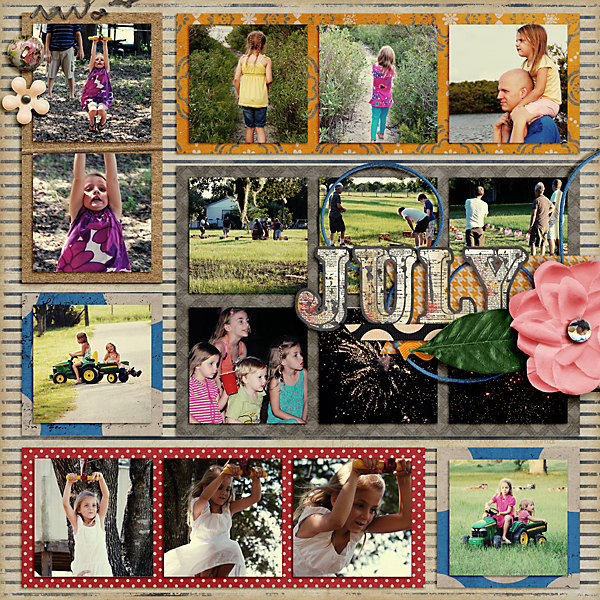 Made with the Iron Scrapper Week 2 Kit - The template and kit will be at Scrap Orchard soon! First bathtime....probably ever. Just so you know (in case you don't read the journaling) she loves bath time now. 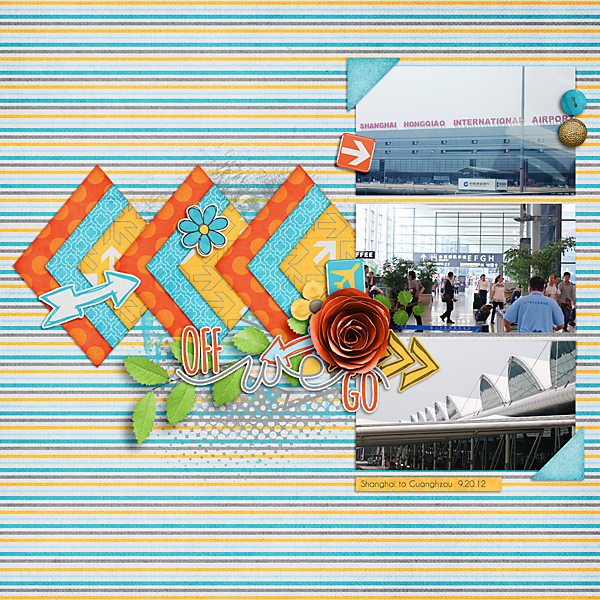 Airport pictures...because I wanted to remember everything. Our typical lunch while in China. I think these next two are my fave pages of all...or maybe it's just my favorite memory. 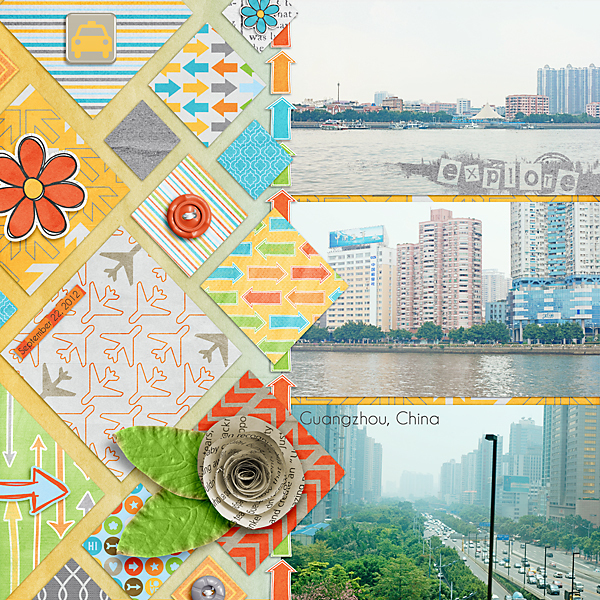 This was made with my new templates releasing tomorrow. I just love all the photo spots. I did scrap this first and then turned it into a template. Using my new templates releasing tomorrow! (consider this another sneak peek). Here's the left side. I just love the way it looks close up. And the right side close up. This photo was taken last year as Cheryl and I made our way to Vegas for Scrap Orchard's Convention. 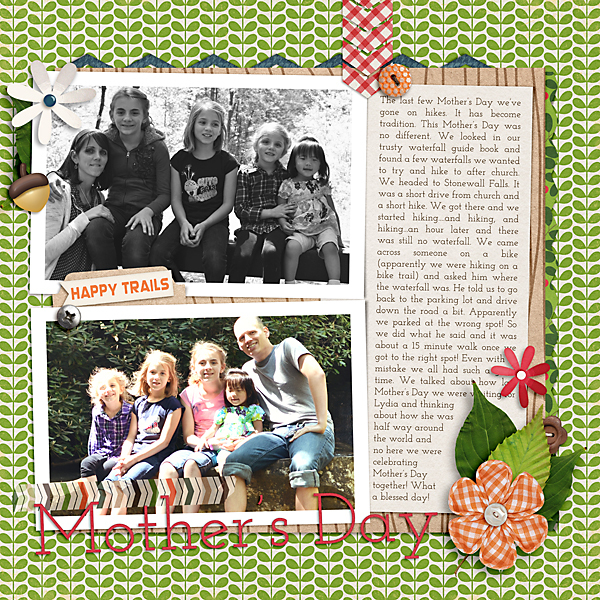 Here is my first Mother's Day with all 4 of my girls by my side. And then 4th of July this year...actually, these were taken on the 6th, but who cares. We saw fireworks. There they are. 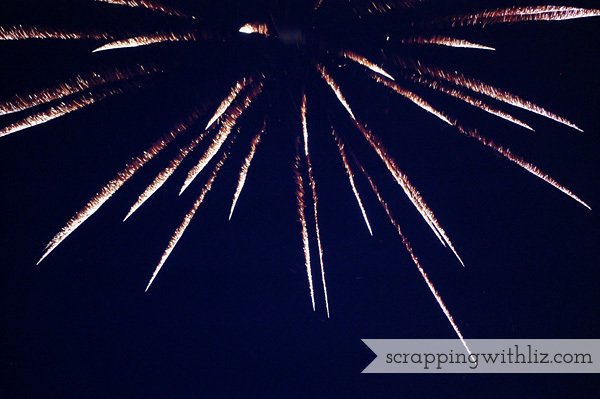 How is your scrapping going? 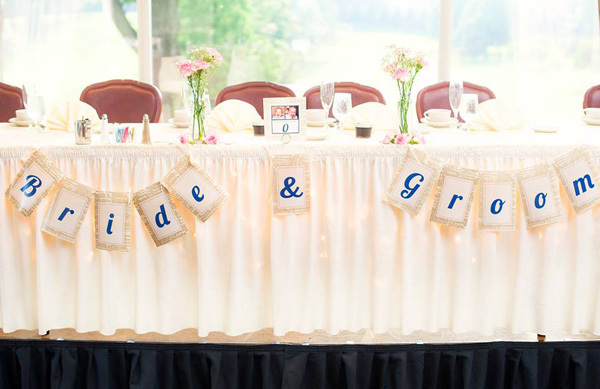 I have Donna here today to share with you (and me) how she used Digital Scrapbooking to help her with her daughter's wedding. 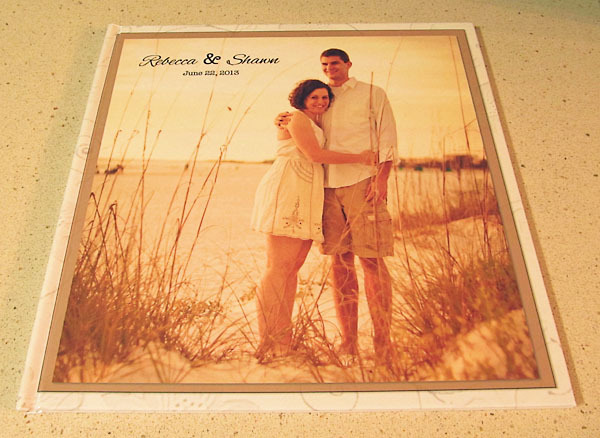 She used her digital scrapbook knowledge to really personalize her daughter's wedding and I think it turned out beautifully. 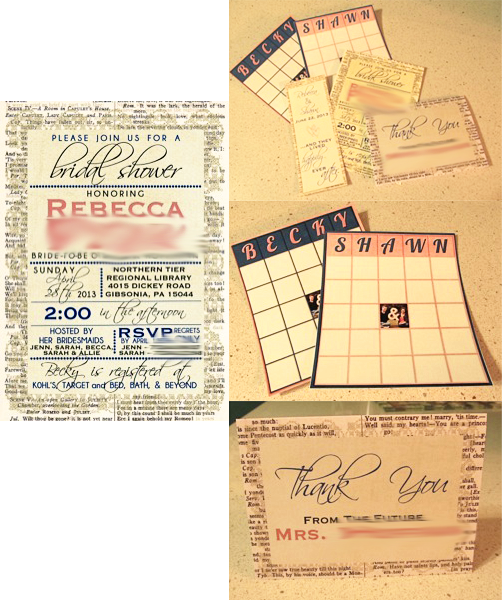 When my daughter Becky told us that she and Shawn were finally engaged after dating for 6 years, I knew that I would like to make her wedding invitations. But, oh my, what did I get myself into?! Not only did I make the invitations, but I also I made the shower invitations and thank yous. 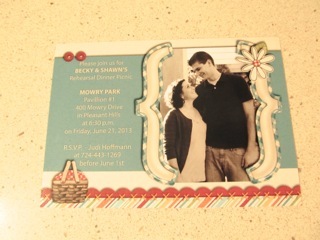 I made the rehearsal dinner invitation. I made the reception guest book. 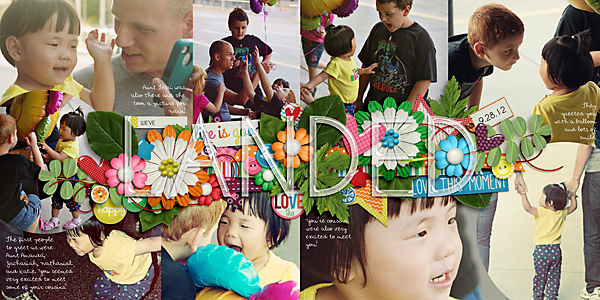 I made banners. I made table numbers. 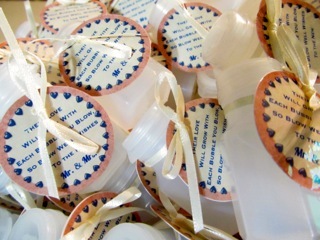 I made labels for bubbles and the jelly jars that served as place cards and were also color coded as to what meals the guest had ordered. That's not all. I made bridal bingo cards and book marks. I made gift tags to add to her gifts for her attendants. I made the program that was passed out at the church. 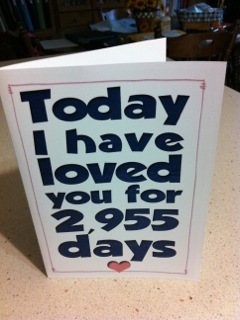 I even made the card that she gave to her husband-to-be the night before the wedding. 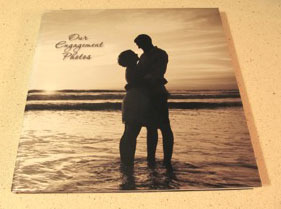 Oh, and I made her a photo book of her engagement photos that was delivered to me just in time to give it to her and Shawn at the rehearsal dinner. And on top of all that, I also baked 200 dozen cookies. (Cookies are a big thing at Pittsburgh weddings, but that's a whole other story!) Phew! No wonder I haven't slept in weeks. 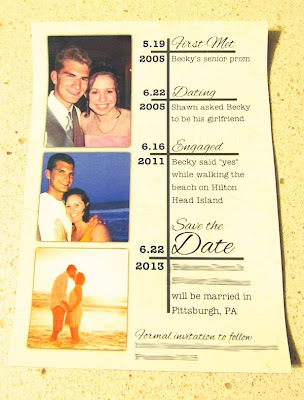 The very first thing to make was the save-the-dates. Becky found a few ideas from Pinterest. In fact, she found a lot of ideas on Pinterest. All I had to do was re-create them. We found a place that prints on magnets. http://www.printpelican.com did a great job printing what we had created. Next, she wanted me to make a reception guest book. At that time, I was using Creative Memories sbcStudio software and they had a reception book and all I had to do was add photos and print. So we added scanned photos of her and Shawn. But then we had to change all the fonts because they apparently were not acceptable for Becky (I should mention that she is an English teacher - that would explain a lot of the changes I had to make on almost every single item). 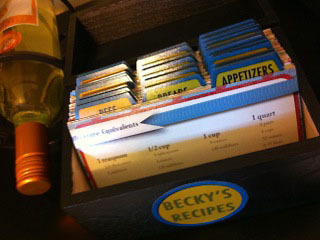 In the meantime, I had a bright idea to make Becky some new recipe cards to give to her as part of her shower gift. I used your Photo Starter templates for the name tag on the front of the box and your Recipe card templates and then took a picture of each of her Fiesta Ward dishes and matched the colors. These dividers and recipe cards were printed at Persnickety Prints, and are waterproof - perfect for recipe cards. Next up were the shower invitations. Becky again searched Pinterest. She then proceeded to tear pages out of her favorite book of Shakespeare to be used as the background. 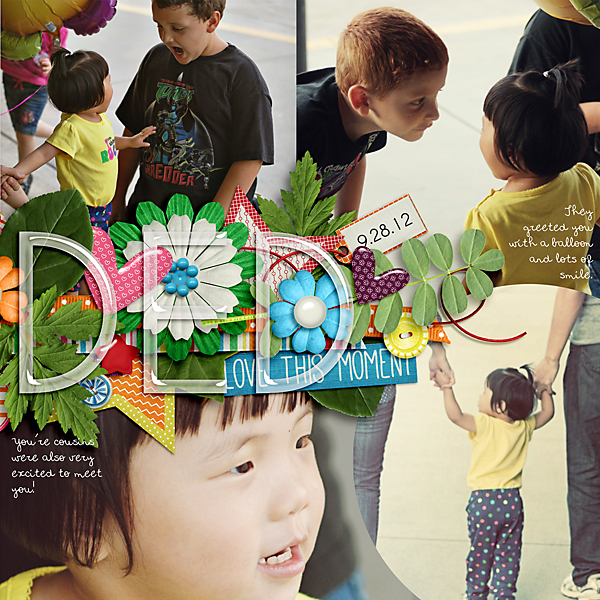 She picked her fonts and her colors. In preparation for this, I took Jessica Sprague's class just for making invitations and announcements. The classes were very helpful. 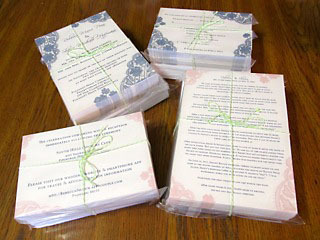 I also made thank you cards, bridal bingo cards (using your Bingo Card Templates), bookmarks and banners for the shower. Now we needed an invitation to the rehearsal dinner. This was easy. 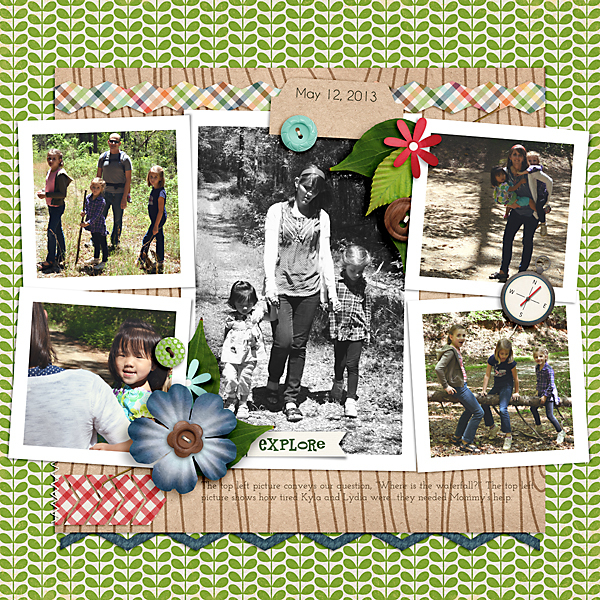 I used your "A Little Variety Card" templates, another cute engagement photo, and A kit from the designers at Scrap Orchard called Perfect Picnic, that was free with a purchase. Next, the wedding invitations. These were a major production, changed several times, but we both finally decided on one that Becky loved. She wanted simple. I found a piece of digital lace (sorry, it didn't have a name that I could identify it's designer by) and changed it's color to blue for part of the invitation and pink for another part of it. 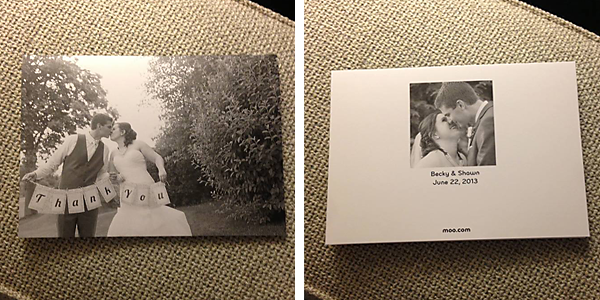 Becky helped design the main invitation, and an insert titled "The Story of Us," which tells the story of how they met and survived the past 8 years of dating. Again, I had these printed at Persnickety Prints. 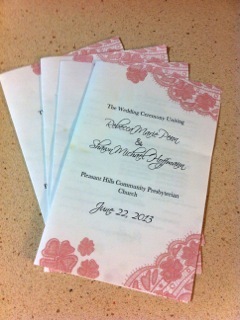 We used the same theme for the program that was passed out at the church. Also, to be passed out at the church were bubbles for after the ceremony. Once again, we used your Photo Starter Templates. I found a cute circle of hearts from Connie Prince's Globetrotters kit that was perfect for this. Becky found the poem on Pinterest, of course. A week before the wedding, I decided to finally scrap all those engagement photos. 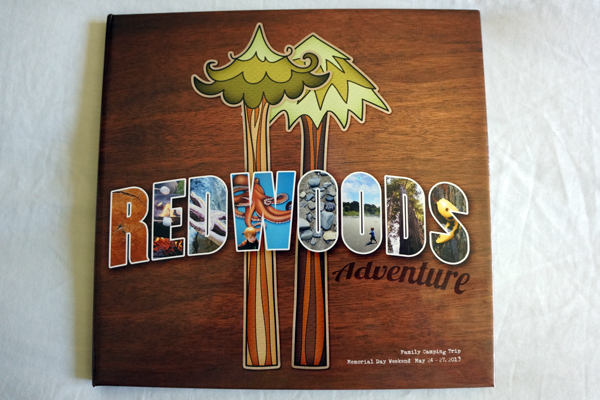 I had this printed as a 10x10 book at Adoramapix.com. I love their books. I gave this to Becky and Shawn at the rehearsal dinner and they loved it. Then Becky had an idea for a card that I need to make to give to her fiancé for their wedding. Font is Grobold. We had this printed at Walgreen's. I can send them a card and by the time I drive the mile to the store, it is done and ready to go. Becky's future mother in law made jelly and put it into jelly jars that we used to tell each guest which table to sit at. The labels were also color coded as to which meal they had ordered. 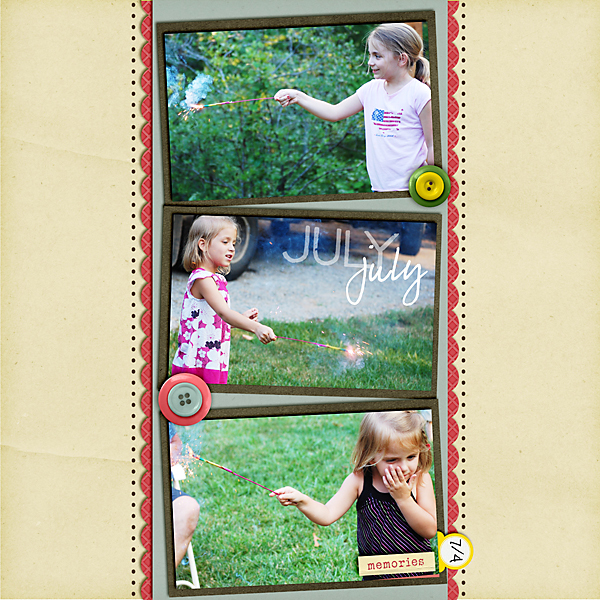 Again we used your Photo Starter circle templates, also your Date Seals "make your own" (no longer available). Fonts used were Lobster, Copperplate, Scriptina, and JFRingmaster. These were printed at home using Avery Sticker label. We made one more thing for the wedding that did not involve scrapbooking, but I'd like to share. 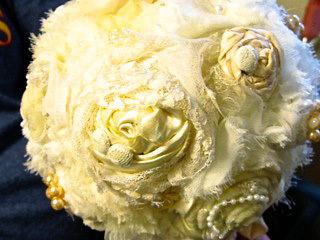 Becky's bouquet was made out of the lace, satin and sheer fabric, and buttons that used to be my mother's wedding gown. We think it is beautiful! The day was beautiful. We had lots of compliments on all the things we created for the wedding. My next venture will be taking all the wedding and honeymoon photos and making them a scrapbook. And then we get to start planning my other daughter's wedding! 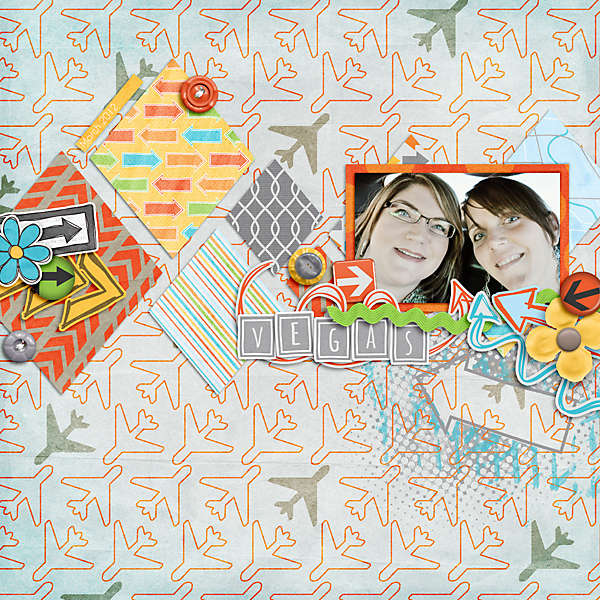 Today I'm going to link you up to a fellow digi-scrapper, friend and team member's blog. She's just posted pictures of her AdoramaPix Album and some of her fireworks photos. I just LOVE her AdoramaPix Album. I've ordered a book through AdoramaPix too, and I really love the lay flat pages. 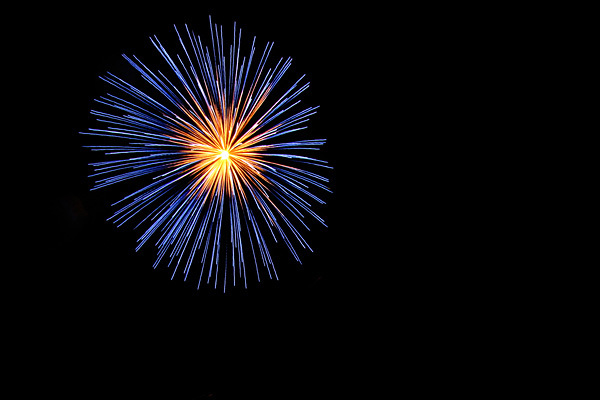 Tiff also recently practiced her firework photography skills and I think she did a great job! 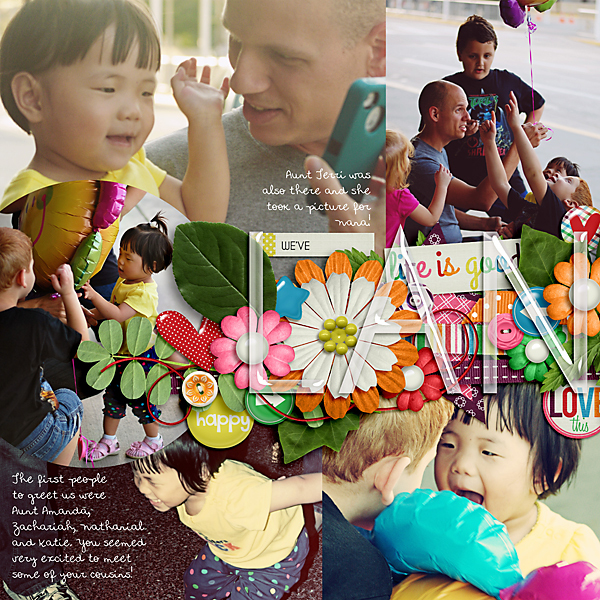 Go on over to this blog post to check out what she did to get some great shots. I admire Tiff's pages and the projects she's accomplished. Do you have any favorite digi-scrappers that you look up to? 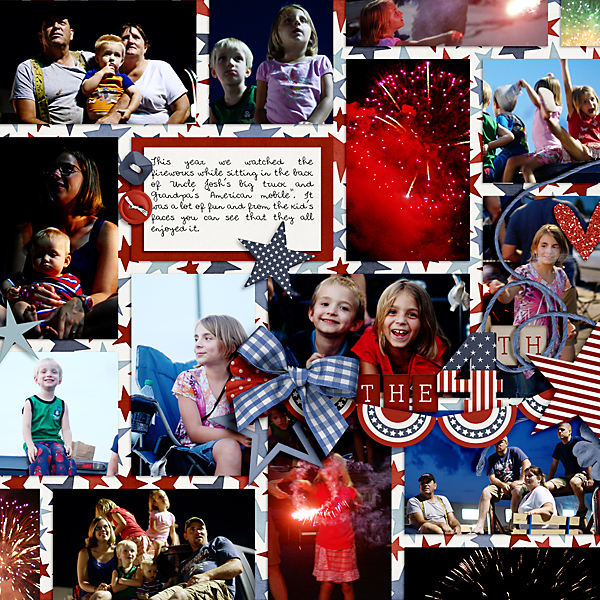 Last week I shared some of my past July 4th pages and then some tips on photographing fireworks. I told you I would come back and let you know how my fireworks photos turned out. I was able to carry out 3 of 4 of the tips I gave on my blog post. Unfortunately, I brought the wrong tripod! So that was out. I was able to set my ISO, use manual mode to set the shutter speed to BULB mode, and I used no flash. I loved using BULB mode, definitely doing that again. I do believe my pictures were better than in past years. Next year I will remember the tripod...I think it'll make all the difference. I did manage to scrap a few of the pictures from the fireworks show. It was such a crazy 4th. We were traveling last week. It ended up being rainy where we were and it was also rainy in our hometown. The fireworks had been postponed until the 6th and we were home just in time for them. I was so happy that Lydia was able to see her first fireworks show...even if it was on the 6th.